FRANKFURT (Reuters) - Deutsche Bank <DBKGn.DE> named retail specialist Christian Sewing as its new chief executive officer with immediate effect on Sunday, signalling a possible retreat from almost three decades of empowering investment bankers at Germany's largest lender. Sewing, a German national, will replace John Cryan, a Briton, as the bank seeks to strengthen its brand in its home market. Cryan had been in charge since 2015 and his mandate would have expired in 2020, but investors had lost faith that he could return the bank to profitability after three consecutive years of losses. "Following a comprehensive analysis we came to the conclusion that we need a new execution dynamic in the leadership of our bank," Chairman Paul Achleitner said in a statement. Sewing, 47, had been deputy CEO, with a background in retail banking, auditing and risk. His promotion comes as the bank and its major shareholders debate the path forward for Deutsche's investment banking unit, where revenues have slowed and key staff defected. His appointment could suggest a shift in emphasis away from a strategy of seeking profit growth through the investment bank and giving investment bankers greater influence. Deutsche Bank began its investment banking push with the purchase of Morgan Grenfell in 1989. Sewing topped a list of candidates as the preferred option presented by Achleitner at a hastily arranged board call on Sunday evening, two people familiar with the matter said. A second external candidate was also proposed, one of the people said. Cryan will leave at the end of this month, the bank said. Garth Ritchie and Karl von Rohr will serve as deputy CEOs. Marcus Schenck, who was co-deputy CEO and helped oversee the investment bank, is also leaving, Deutsche said. In picking up the baton, Sewing faces challenges including further cost cutting, intense competition at home and abroad, and increased regulation. Sewing, a member of the management board since 2015, had been overseeing Deutsche Bank's private and commercial bank division, which includes the Postbank retail banking unit. He joined Deutsche Bank in 1989 and has worked in Frankfurt, London, Singapore, Tokyo and Toronto. "Our view is that Sewing seems to be an OK candidate," said one major investor who spoke on condition of anonymity. Sewing's appointment was a blow to Schenck, a former Goldman Sachs <GS.N> investment banker long considered a future CEO at Deutsche. Achleitner began a search last month to replace Cryan following a flurry of negative headlines after the bank reported a third consecutive annual loss. "Mr. Sewing urgently needs to bring a sense of calm back to the bank," said Ingo Speich, a fund manager at Union Investment, which holds Deutsche stock. The leadership debate also paralleled concern about the direction of Deutsche's investment bank, whose swift expansion in the years leading up to the financial crisis has been blamed for many of the bank's current woes. The investment bank's revenue in 2017 was down 25 percent compared with 2015, a steeper fall than the declines suffered by its rivals. The division employed more than 41,000 staff at the end of 2017, up 4 percent from 2015, but key staff have left. The bank is conducting a global review of the investment bank, known internally as Project Colombo, a person with direct knowledge of the matter has said. Ritchie will be the sole head of the investment bank, Deutsche said. Octavio Marenzi, CEO of consultancy Opimas, said Sewing's appointment will mean a greater focus on commercial and retail banking and wealth management. "It looks like the board of directors is capitulating on the investment banking front," Marenzi said. Cryan, the son of a jazz musician, took charge at Deutsche less than three years ago to overhaul the bank, draw a line under a string of legal disputes, and cut costs. But his tumultuous tenure highlighted many of the bank's underlying issues. Early on, Cryan quickly announced thousands of job cuts, but he later reversed the bank's plans to sell its Postbank unit after tepid interest from buyers. 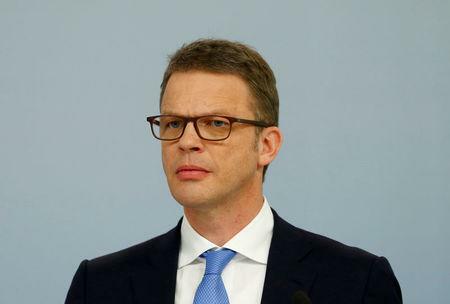 Some of Germany's most senior politicians criticised him for paying 2.3 billion euros ($2.8 billion) in staff bonuses, four times higher than the previous year, after the bank made losses in 2017. The bank's chief operating officer Kim Hammonds told colleagues recently that Deutsche was "the most dysfunctional company" she had ever worked for, according to a person with direct knowledge of the matter.